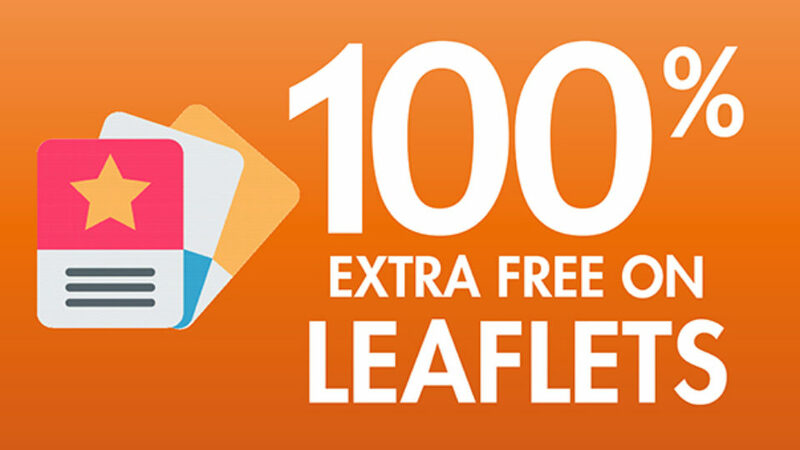 We’ve gone leaflet crazy and have decided to offer all customers 100% Extra Free when they order 250 leaflets or more. Saving you money on your business promotions and marketing is our goal, providing cost effective solutions that provided the maximum impact. We can handle that too, as we have in-house design expertise with knowledge across 99% of sectors and industries. Give us a call on 0208 643 6466 or use or contact form so you can upload your file along with your request. This offer was corrected 17th January 2019. All items are printed on a 3 – 5 working day turnaround from artwork approval, on stock as specified. All prices are based on supplied print ready artwork. We accept artwork as print ready if it is in PDF format with a minimum of 3mm bleed and trim marks. All other file types will incur a setup charge of £20 + VAT. Excludes delivery, folding, finishing or quantities not specified. Double sided printing only. Offer ends 31st March 2019. Prices may change without notice due to fluctuating prices of paper and consumables. Can not be used in conjunction with any other offer. VAT at 20% will be applied where applicable (eg. if the leaflet is written on).